To demonstrate what the City of Alton’s proposed Pedestrian and Bicycle Plan would look like, with temporary paint, the team created a depiction of what the road could resemble when the plan is executed, according to Connie Frey Spurlock, PhD, SSCC faculty director and associate professor in the Department of Sociology. The SIUE/STL Art Hive, hosted by SIUE’s art therapy counseling program, was also present at the pop-up event. The Art Hive provided community members the opportunity to provide feedback on the demonstration with art materials. In his support of the idea, Bill Simon, owner of Bill Simon Equipment, Inc., donated a bicycle to the SSCC. The bicycle will be part of a raffle at SSCC’s wrap-up event Thursday, April 18 at the Old Bakery Beer Co. in Alton. SIUE Successful Communities Collaborative (SSCC) is a cross-disciplinary program that supports one-year partnerships between the University and communities in Illinois to advance local resilience and sustainability based on community-identified environmental, social and economic issues and needs. Our mission is to connect Illinois communities with the students and faculty of the University. SIUE is a student-centered educational community dedicated to communicating, expanding and integrating knowledge. In a spirit of collaboration enriched by diverse ideas, its comprehensive and unique array of undergraduate and graduate programs inspire professionals, scholars and leaders who shape a changing world. 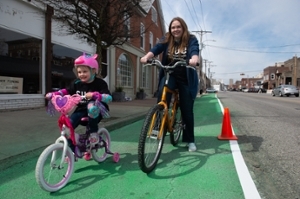 L-R: Seven-year-old Charlie Master, daughter of Sarah Masters, a senior majoring in sociology, sets out on a ride with her mother. 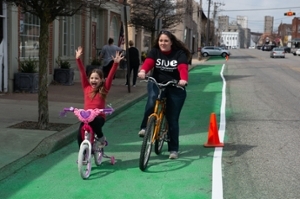 L-R: Seven-year-old Sophia Yates enjoys a bicycle ride with her mother, Amy Yates, a senior majoring in sociology.